Some may say being sustainable or going green is a trend. However, I personally believe that it’s here to stay. On the other hand, there are many businesses that are afraid to take measures towards a more sustainable or eco-friendly approach as it may hurt top and bottom lines. While it may be true that an implementation of any program or system does indeed bear an initial cost, down the line the returns do outweigh the initial cost of implementation. 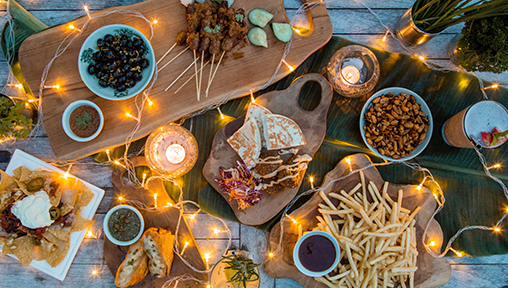 Let us champion the F&B businesses that have taken measures towards a more sustainable business operation, and at the same time, share with the ones that do not have any programs in place what their fellow F&B businesses are doing. The list of F&B businesses featured is a mixture of hotels, bars and restaurants who are at the forefront of the green movement. As it is, these establishments have fantastic food and drinks to look forward to. The brainchild of founder and head bartender Vijay Mudaliar, Native aims to reduce waste associated with the operations of the bar. One example that I found that lent to the identity of the bar is the reusable drink coasters made from Lotus leaves and after each use, it is dehydrated again. While admiring the coasters, order a drink. A few crowd pleasers to ask for are the Red Light District and Ceylon Arrack. It is important for a hotel to have visionary and forward-thinking leaders and the Director of Food & Beverage of the Grand Hyatt, Jerome Pagnier, personally leads the charge along with his team towards a greener business. For a hotel, food waste is a huge issue to tackle. Beyond reducing food wastage and donating what they can, the Grand Hyatt has a Waste Management System where the hotel has installed a digester machine that now converts its food waste into organic fertiliser for the hotel’s landscaping purposes. The dining menu features organic crops produced in the hotel’s rooftop garden and the drink menu has been redesigned to remove all single-use plastic straws and stirrers. Check out the epic champagne Sunday brunch at Mezza9, which certainly gets better every time I go. Both properties of The Fullerton Hotels have launched initiatives to go greener. By implementing water and energy efficient machinery and systems, The Fullerton Hotels were able to reduce water consumption. From June 2018, the provision of plastic bottled water at conference, banquet and meeting rooms has been minimised. Refillable water pitchers have been made readily available instead. All the dining outlets have also started implementing biodegradable straws made from potato starch. 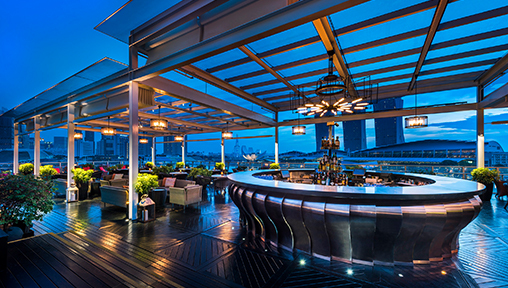 For Friday after-work drinks, check out the Lantern Bar with its panoramic views of Marina Bay. Be sure to order their famed mojitos or the Red Lantern cocktail with flavours of watermelon and cucumber. Tucked away at the top of Mount Sophia, Kult Kafe offers that getaway we all so need from the city. With a strong focus on the green movement and sustainable ingredients, Chef Hana and her team have done away with plastic straws and now use metal ones instead. Kult Kafe has also started to beef up on recycling as a method of disposal and has even created its own compost bin for waste. Be sure to order the Crunchy Falafels and house-made Nachos when you visit. The newly opened boutique hotel on Duxton fuses Asian wellness with sustainability. It shows most prominently in its modern Chinese restaurant and bar called Yellow Pot. Created by Chef Sebastian Goh, the menu features ethically sourced ingredients like kühlbarra barramundi which is farmed off the coast of Singapore. Be sure to order the Roast Duck that has been marinated by fermented bean curd and I personally really enjoyed the Lemongrass & Calamansi Jelly which cleaned the pallet. Himmat Shergill is an avid cook who enjoys every aspect of the food and wine world.He also enjoys watching documentaries, walking his dog and along the way, breaking a few rules. Follow him on Instagram at himmat_shergill.